Nine months of political paralysis in Brazil have come to an end after the upper house of Brazil’s parliament decisively voted to strip Dilma Rousseff of her presidency for budgetary violations committed during her term. Sixty-one senators voted for the impeachment, with only 20 standing by the president, who was suspended in May for manipulating data to conceal the scale of economic problems that have piled up since she assumed power five years ago. But 68-year-old Rousseff was handed a lifeline after the Senate voted not to bar her from holding government office for the next eight years. According to the constitution, an impeached president faces this ban by default, but Chief Justice Ricardo Lewandowski, presiding over the hearing, allowed a separate vote on the matter. Forty-two senators voted in favor of Rousseff, and 36 against, with three abstentions. Conservative Vice-President Michel Temer, who has deputized for socialist Rousseff since her de facto ouster three months ago, was sworn in as president later on Wednesday, and will serve out the remaining two years of her term. "Today's legal farce removes me from the position I was elected to by the people," Rousseff said in her personal blog after the impeachment. "The will of 61 senators has replaced that of 54,5 million people who voted for me." Rousseff’s lawyer immediately said she would appeal the impeachment through the Supreme Court. "Right now I will not say goodbye to you. I am certain I can say, 'See you soon,'" Rousseff said to a gathering of her supporters in capital Brasilia after the session. Rousseff - the country's first female leader - is also the first Brazilian leader to be dismissed from office since 1992, when Fernando Collor de Mello resigned before a final vote in his impeachment trial for corruption. While Rousseff’s budget-balancing tricks, which included delaying government repayments to banks to underplay the deficit, are thought to have also been used by her predecessors, the former guerrilla fighter’s popularity has cratered: Brazil suffered six consecutive quarters of negative growth and is mired in corruption scandals implicating officials close to the outgoing president. Nonetheless, Rousseff’s ousting means a sea change for a country that was ruled by the left-wing Workers’ Party for the past 13 years. Its activists have been staging thousands-strong protests in support of the deposed politician, and are expected to resume them following the latest decision. 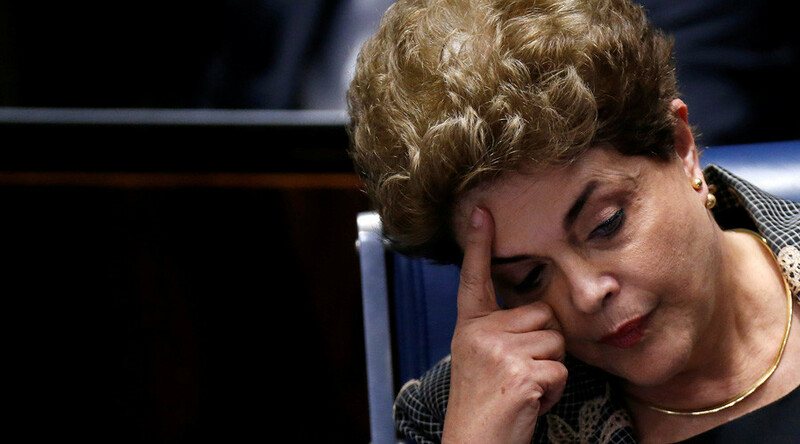 Senate refuses to make Dilma ineligible to run for 8 years. So she is allowed to run in 2018, but the newly installed President is barred. Meanwhile, Temer, a 75-year-old career politician, who is ironically himself barred from running for office due to electoral violations, faces an uphill task. His financial reforms, reeling back from the lavish social spending of Rousseff’s administration, have curried favor with investors, but not the electorate, with his cabinet’s popularity ratings no higher than those of his predecessor. American economic adviser David Riedel said that the country now had no chance but to embrace economic reforms, in the wake of a fall of commodity prices that led to the rise Rousseff, and her predecessor Luiz Inacio Lula. “International investors will give Brazil the benefit of the doubt. So if they become more business-friendly, and investor friendly, and cut back on the profligate spending, which is an issue across South America, investors will give Brazil a second look,” he told RT. Temer will also shoulder the difficult task of restoring Brazil’s credibility abroad, which has suffered in recent months, after years when the country was seen as the shining light of the continent’s economy. Temer is due to travel to China to participate in the upcoming G20 meeting in Hangzhou. Meanwhile the government of longtime Rousseff ally Venezuela has already said that it is freezing relations with Brazil and recalling its ambassador following the impeachment. Ecuador and Bolivia have also called back its top diplomats in Brasilia. Several experts interviewed by RT condemned proceedings, and claimed that Wednesday’s decision would give rise to a new cycle of active unrest. “This was not a real trial for Rousseff. Most of the senators had made up their minds before, and there was no legal reason for the prosecution” said Maria Mendonca, from the University of Rio de Janeiro.